If you miss my article about, “why should I delete browser’s history and cookies?” feel free to read it here. Browser’s history and cookies are helpful in our online life, but if you value security and privacy more, removing it is the best thing to do. We have top three browsers in the world, namely; google chrome, mozilla firefox and internet explorer. Each of which has a different settings. Therefore, we will be erasing its history and cookies in three different ways. Benefits of removing browser’s history and cookies. You will feel safer and secured even if you forgot to log-out your account because once the history and cookies are deleted it will ask new information. You will maintain your confidentiality, from all of your online activity. It is also safer for children there are no ways that they can view adults visited site. Disadvantages in erasing browser’s history and cookies. Everything is fresh in your browsers, you will have to input your entire log in credentials anew. It may take a little time and effort but it doesn’t outweigh safety, security and privacy. How to remove browser history & cookies in google chrome in three (3) clicks? You can check more boxes if you wish, just don’t forget to select the “beginning of time” in the obliterate the following items from drop box. To erase all stored data. How to remove browser history and cookies in Firefox in four (4) steps? 3. Pick the “clear your recent history”, you will be prompted with a “time range to clear” drop down box. Choose the best option for you. 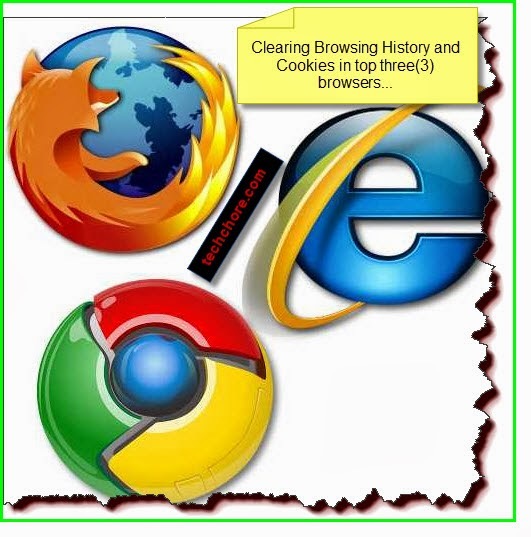 How to clear away browser history in Internet explorer in three(3) moves? Sweeping browser history and cookies doesn’t guarantee 100% safety but it may help. It has also its own drawback. Nonetheless, this post may help you evaluate the right action to take.